Hitchcock "discovered" the cover girl while viewing a commercial on NBC's "Today Show" and summoned her to Hollywood under personal contract. After the release of The Birds, he starred her in Marnie, with Sean Connery. 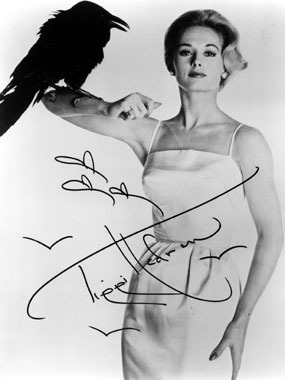 Judith Crist wrote, "Alfred Hitchcock had given us one Grace Kelly in our generation and seems intent on giving us another in the person of Tippi Hedren, a classically beautiful, regally poised blonde". Marnie has achieved cult status as an offbeat psychological thriller, years ahead of its time. Perhaps Tippi Hedren's most unique endeavor is being "den mother" and close friend to sixty-odd big cats - lion, tiger, leopard, cougar, serval and an African elephant at The Roar Foundation's Shambala Preserve near Acton, California. The high desert game preserve is home to the felines and pachyderms and was first established as an African-type set for the motion picture, Roar, which Tippi co-produced and starred in with her daughter, film actress Melanie Griffith. After the five year filming was completed, it became the current, non-profit center for big cat care and research. In keeping with her outlook on the environment and conservation, many of Shambala's residents are cast-offs from private owners, zoos and circuses. "They're living out their lives in safety and comfort." The Preserve is open to the public on a reservation basis. Tippi is founder and President of The Roar Foundation and resides at Shambala in a cottage surrounded by big cat compounds. "I awaken to their roars." The story of Tippi's life and the animals "dearest to her heart" was told in Simon & Schuster's The Cats of Shambala (1985). The updated and revised edition (2003) will soon be available in paperback.